The work of upwithclimate team member, James Stroud, is featured on the Discovery Channel’s Discovery News website. To read the article, follow this link. The Discovery News article is based on a press release by Evelyn Perez and the FIU NEWS, copied below. FIU biology student James Stroud has observed a non-native species of lizard in Bermuda, a potential problem for the island’s critically endangered Bermuda skink. 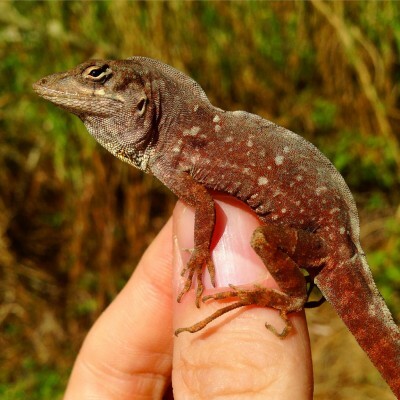 A two-year conservation project studying the island’s lizard populations led to the discovery of the Cuban brown anole, a species once rumored to inhabit the North Atlantic island, but was never verified until now. The introduction of the Cuban anole could pose difficulties for the endangered Bermuda skink, the island’s only native lizard species. Also known as a rock lizard, the skink is listed as critically endangered in the International Union for Conservation of Nature’s (IUCN’s) Red List, the world’s authority on the conservation status of plant and animal species. According to the researchers, Cuban brown anoles excel at thriving outside of their native geographical area. The lizards can live in a variety of natural and human-made habitats, and feed on a variety of prey, potentially putting them at an advantage to other lizard species who might not be as tolerant. After surveying all of Bermuda, Stroud found populations of the Cuban lizard at all life stages indicating they are thriving in the central part of the island. He also found the established Jamaican anole continues to be found all over the island, but the Antiguan anole has significantly expanded into areas where the Barbadian lizards live. The discovery was made alongside former FIU doctoral student Sean Giery and Bermuda’s Department of Conservation Services. Originating in Cuba and the Bahamas, the Cuban brown anole is one of the most widespread lizards outside of its native area with large populations found from Florida to Texas, California, Hawaii, Costa Rica, Singapore and Taiwan. Cuban brown anoles can be found in urban environments including downtown Miami and natural environments such as the Everglades. Anoles are very diverse group of lizards and about 372 species are currently known to exist. Stroud recently traveled to Costa Rica where he conducted the first-ever study of the Cuban brown anole’s ecology and distribution in the Central American country. He is devoting his doctoral research to studying the evolution, interactions and community patterns of Anolis lizards in the tropics. Cuban Brown anole in Bermuda. Photo by J Stroud. This entry was posted in Uncategorized by Ken Feeley. Bookmark the permalink.